Working with Ingersoll-Rand Waterjet Systems, Michael Dixon implemented the first production practical means of cutting titanium sheets--an abrasive waterjet system very similar to those in widespread use today. 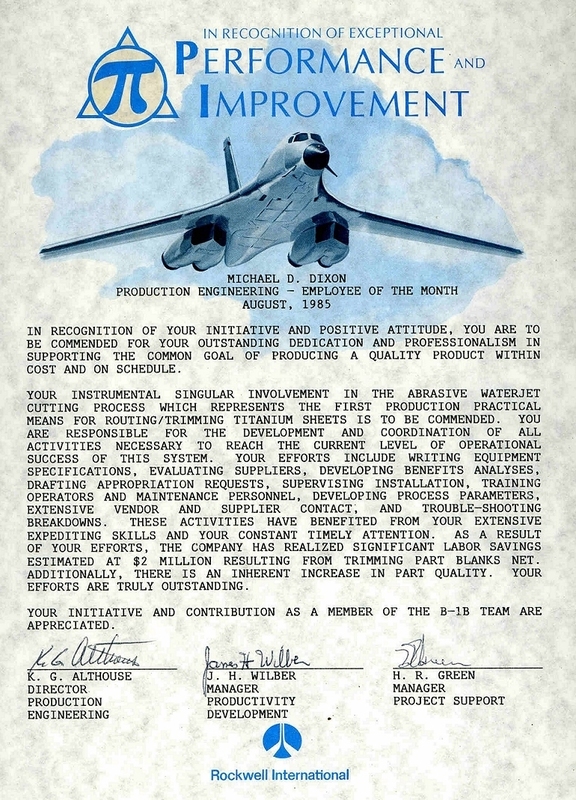 By January, 1985, that system was being run 24 hours a day producing titanium parts for the B-1B largely at Rockwell's North American Aviation facility in Newark, Ohio. By August, 1985, Rockwell estimated the system had already resulted in $2 million in labor savings. Dr. Mohamed Hashish, who led an engineering research team at Flow Industries working on abrasive waterjet cutting technology, was granted a patent for his design in 1987. Dr. Hashish, who also coined the new term Abrasive Waterjet AWJ, and his team continued to develop and improve the AWJ technology and its hardware for many applications which is now in over 50 industries worldwide. A most critical development was creating a durable mixing tube that could withstand the power of the high-pressure AWJ, and it was Boride Products (now Kennametal) development of their ROCTEC line of ceramic tungsten carbide composite tubes that significantly increased the operational life of the AWJ nozzle. Current work on AWJ nozzles is on micro abrasive waterjet so cutting with jets smaller than 0.015 inches (0.38 mm) in diameter can be commercialized. An important benefit of the water jet is the ability to cut material without interfering with its inherent structure, as there is no heat-affected zone (HAZ). Minimizing the effects of heat allows metals to be cut without harming or changing intrinsic properties. Meatcutting using waterjet technology eliminates the risk of cross contamination since there is no contact medium (namely, a blade) between different animals in the slaughterhouse. Materials commonly cut with a water jet include textiles, rubber, foam, plastics, leather, composites, stone, tile, glass, ceramics, metals, food, paper and much more. Examples of materials that cannot be cut with a water jet are tempered glass, diamonds and certain ceramics[which?]. Water is capable of cutting materials over 18 in (460 mm) thick. Uses a high velocity stream of Ultra High Pressure Water 30,000–90,000 psi (210–620 MPa) which is produced by an intensifier pump with possible abrasive particles suspended in the stream. A 5-axis cutting head can be used to cut 4-axis parts, where the bottom surface geometries are shifted a certain amount to produce the appropriate angle and the Z-axis remains at one height. This can be useful for applications like weld preparation where a bevel angle needs to be cut on all sides of a part that will later be welded, or for taper compensation purposes where the kerf angle is transferred to the waste material – thus eliminating the taper commonly found on water jet-cut parts. A 5-axis head can cut parts where the Z-axis is also moving along with all the other axis. This full 5-axis cutting could be used for cutting contours on various surfaces of formed parts. ↑ Fourness, Charles A et al, Paper Metering, Cutting, and Reeling, filed May 22, 1933, and issued July 2, 1935. ↑ Johnson, Carl Olof, Method for Cutting Up Plastic and Semi-Plastic Masses, filed March 13, 1956, and issued April 14, 1959. ↑ Schwacha, Billie G., Liquid Cutting of Hard Metals, filed October 13, 1958, and issued May 23, 1961. ↑ Jenkins, Dennis R & Tony R Landis, Valkyrie: North American's Mach 3 Superbomber, Specialty Press, 2004, p. 108. ↑ Rice, Phillip K., Process for Cutting and Working Solid Materials, filed October 26, 1962, and issued October 19, 1965. ↑ Leach, S.J. and G.L. Walker, The Application of High Speed Liquid Jets to Cutting, Philosophical Transactions of the Royal Society of London Series A, Mathematical and Physical Sciences, Vol 260, No 1110, July 28, 1966, pp. 295–310. ↑ Franz, Norman C., High Velocity Liquid Jet, filed May 31, 1968, and issued August 18, 1970. ↑ Chadwick, Ray F Chadwick, Michael C Kurko, and Joseph A Corriveau, Nozzle for Producing Fluid Cutting Jet, filed March 1, 1971, and issued September 4, 1973. ↑ Franz, Norman C., Very High Velocity Fluid Jet Nozzles and Methods of Making Same, filed July 16, 1971, and issued August 7, 1973. ↑ Olsen, John H., George H. Hurlburt, and Louis E. Kapcsandy, Method for Making High Velocity Liquid Jet, filed June 21, 1976, and issued August 12, 1980. ↑ Berry, Mitchell M., Piston Sealing Assembly, filed March 3, 1941, and issued March 23, 1943. ↑ Templeton, Herbert W., Metering Valve Seal, filed July 11, 1958, and issued July 18, 1961. ↑ Webb, Derrel D., High Pressure Packing Means, filed August 12, 1957, and issued October 17, 1961. ↑ Hogan, John Paul and Robert L. Banks, Polymers and Production Thereof, filed March 26, 1956, and issued March 4, 1958. ↑ Olsen, John H., High Pressure Fluid Intensifier and Method, filed January 12, 1973, and issued May 21, 1974. ↑ Olsen, John H., High Pressure Fluid Intensifier and Method, filed March 16, 1976, and issued June 14, 1977. ↑ Smith, Elmo V., Liquid Blasting, filed June 10, 1935, and issued May 12, 1936. ↑ Tirrell, Leslie L., Sandblast Device, filed April 3, 1937, and issued October 17, 1939. ↑ Hashish, Mohamed, Michael Kirby and Yih-Ho Pao, Method and Apparatus for Forming a High Velocity Liquid Abrasive Jet, filed October 7, 1985, and issued March 10, 1987. ↑ Olsen, John H., Motion Control for Quality in Jet Cutting, filed May 14, 1997, and issued April 6, 1999. ↑ Olsen, John H., Motion Control with Precomputation, filed October 7, 1993, and issued April 16, 1996. ↑ 31.0 31.1 31.2 31.3 Lorincz, Waterjets: Evolving from Macro to Micro. Momber, A.W., Kovacevic, R.: Principles of Abrasive Water Jet Machining, Springer, London, 1998.